Would you like to hop off the streetcar and travel by kayak? How about losing yourself in a wooded ski trail on your lunch break? Maybe you’d like to visit a new island, within view of Toronto’s existing Islands? This will all be possible after 2024. 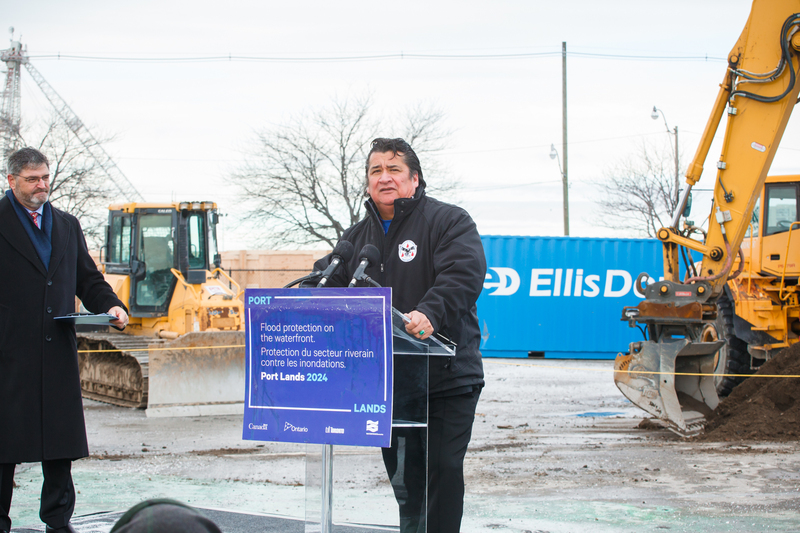 This winter, Waterfront Toronto started excavation on a new kilometer-long river valley and new mouth for the Don River – a key part of our $1.25-billion, seven-year construction project protecting almost 300 hectares of waterfront land from flooding. Along with 40 hectares of new parks and green spaces, we’re creating an entirely new island right downtown. Once developed, Villiers Island will provide homes, community amenities and places to work for thousands of people. Port Lands Flood Protection includes new parks and public spaces, along with the essential infrastructure to create the foundation for a complete community on the future Villiers Island. That includes roads, bike lanes, bridges, underground pipes and utilities. Find the full breakdown of what we’re building here. And learn how you can get involved here. Looking west from Don Roadway towards the Inner Harbour and Toronto Islands. In the foreground, you can see Corktown Common, a park we built in 2014 that doubles as flood protection for the emerging West Don lands community. South of Lake Shore, you can see our construction area in the Port Lands, framed by the Keating Channel to the north and Ship Channel to the South. 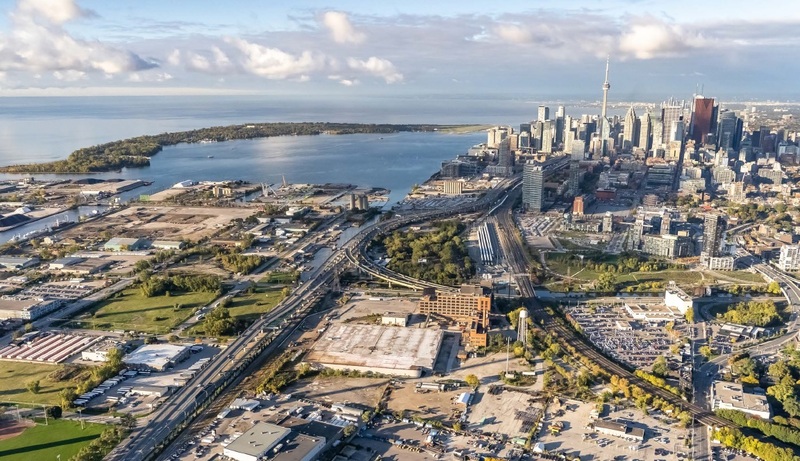 In 2014, Waterfront Toronto completed a flood protection landform beneath Corktown Common that protected 210 hectares of Toronto’s downtown east end and a portion of Toronto’s financial district from flooding. This first phase of flood protection allowed us to develop the West Don Lands, a now thriving community with new affordable housing, parks, community amenities and an extension of the 514 streetcar line. The Port Lands has this same potential — on a larger scale. This 400-hectare area is almost one third of Toronto’s waterfront. It’s as big as downtown Toronto from Spadina to Parliament Street and Front to College Street. But new homes, workplaces and parks can’t be built there unless the risk of flooding is removed and the legacy of contamination left by former industrial uses is addressed. In 2017, governments announced a joint commitment of $1.25-billion for Waterfront Toronto to do just that. Port Lands Flood Protection is a game changer. It allows us to build the new river valley, parks, public spaces, streets, and infrastructure that lay the foundation for future communities in the Port Lands. Construction is now well underway in the Port Lands. Check out the latest construction notices and images here. Find a project timeline here and a construction schedule here. We’ve been asking members of the waterfront community to tell us what excites them most about this game-changing project. We’ve gotten lots of postcards telling us what people are most looking forward to when this project is complete in 2024. So, what will you do in 2024? Fill out this quick poll and let us know what you’re most excited about! Community members and project partners braved the cold back in November 2018 to help celebrate construction progress on this project. From left: In November 2018, MP Adam Vaughan, Toronto Mayor John Tory, MP Julie Dabrusin, Toronto City Councillor Paula Fletcher, Federal Minister of Infrastructure and Communities François-Philippe Champagne and Waterfront Toronto Board Chair Helen Burstyn surrounded by project partners and community members as we marked the start of excavation on the new river. In November 2018, Mississaugas of New Credit First Nation Chief Stacey LaForme reminded the crowd at Cherry and Commissioners Streets that they were standing on a former river.